Recording work and data in the form of thousands of pictures or hours of video is made possible by compact memory cards. 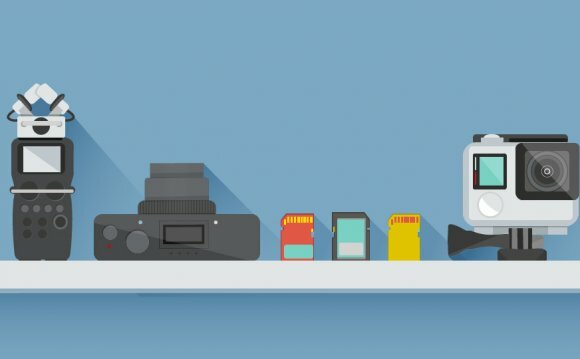 These devices are the standard for photo and movie storage, saving and protecting your files until you can transfer them safely to a more permanent home on your computer or external hard drive. They are available in an array of different types, with a broad range of capacities and data-transfer speeds. The various card types include CompactFlash (CF), Secure Digital (SD), microSD, Memory Stick (MS), XQD, SxS-1, SxS PRO+, P2, and microP2. They differ in form factor and the type of interface they use. Across types and within the same type, cards are differentiated by capacity, read speed, write speed, data protection capability, and durability. Currently, memory card capacities stretch across a broad range, from 2GB to 512GB, and the technology allows for 2TB of maximum storage. Speeds are typically listed in MB/s or Gb/s, and many cards also feature an “x” rating, such as 400x or 1000x, which is used as a shorthand for speed and often appears as part of the name of a card, allowing for quick and easy comparisons of different models (the higher the rating, the faster the card). The “x” represents the standard 150KB/s data transfer rate of a CD-ROM drive. Multiplying this by the number preceding the x in a card’s rating will tell you that card’s maximum transfer speed. CF cards exist in both Type I and Type II formats, although the smaller Type I, which draws less power and is exclusively a type of flash media, is much more common. CF cards are larger in size than SD cards and are known for their physical durability. To denote transfer speeds, they use the Ultra Direct Memory Access (UDMA) mode system, in which a number of 0-7 gives you a rough idea of how fast a card will be. Mode 0 permits up to 16.7MB/s and Mode 7 allows for up to 167MB/s. CompactFlash cards often feature the x rating in their names, helping you compare speeds at a glance before getting a more in-depth look, by examining the actual data transfer rates. Among SD cards, the Secure Digital Extended Capacity (SDXC) models have the greatest amount of storage space at more than 32GB, and up to a theoretical 2TB, while Secure Digital High Capacity (SDHC) and SD cards hold up to 32GB and 2GB, respectively. The microSD cards are physically smaller, though they can still feature large capacities and follow the same SD/SDHC/SDXC naming scheme. SD cards, including the micro type, are divided into classes—2, 4, 6, and 10—where the class number denotes minimum write speed. Class 2 means a minimum of 2MB/s write, while Class 4 means 4MB/s, and so on. The Ultra High Speed Class 1 (UHS-I) rating was established when cards became faster and it was possible for minimum read/write rates to exceed 10MB/s. Now, UHS-II cards offer substantially quicker transfer rates than ever before. UHS-I and II cards are capable of huge performance boosts over standard cards, in terms of maximum read/write speeds. A UHS Class 1 rating tells you that the technology allows for speeds of up to 104MB/s. Many UHS-1 cards deliver read/write rates of 80―95MB/s, with a lot of others getting up to about 60MB/s. UHS-II denotes even faster maximum speeds of 312MB/s, with the reality being 250―280MB/s for the current SD lineup. A proprietary memory type used in many Sony devices, Memory Stick PRO Duo cards are similar in size to SD cards and are smaller than the original incarnations of the Sony Memory Stick. The MS PRO-HG Duo offers performance approximately four times faster than the PRO Duo. MS cards also have MagicGate copyright protection technology, which provides authentication and content encryption and decryption to prevent unauthorized copying, and conform to Secure Digital Music Initiative (SDMI) standards. XQD cards, made by Lexar and Sony, use the PCIe interface featured on certain computer expansion cards. In theory, the XQD format has a maximum possible capacity greater than the 2TB limit of other memory card types, though we have yet to see an actual card approaching such massive storage capabilities. They are currently available in several classes: the standard XQD, also known as the H Series, as well as the N, S, and G series. The H and N class support transfer speeds up to 125MB/s, while the S-series supports up to 180MB/s for reading and writing. The newest class, the G series, supports transfer speeds up to 400MB/s to benefit 4K video recording and high-resolution still shooting bursts. Sony's SxS-1 and SxS PRO+ cards were created for the XDCAM EX camcorders and feature the same interface as a computer ExpressCard. SxS-1 cards feature similar performance compared to the PRO+ versions and offer maximum read speeds of 1.2Gb/s (150MB/s), with slightly lower write speeds. SxS PRO+ memory cards support write speeds of up to 1.5Gb/s (187.5MB/s) and maximum read speeds of 1.6Gb/s. Designed for full HD and 4K recording in Panasonic's P2 camcorders, the company's P2 cards have the same maximum transfer speeds as the SxS-1 cards. The microP2 version, which has a form factor identical to a full-size SD card, is UHS-II and features much faster 2Gb/s (250MB/s) rates. To help ensure high reliability, both the P2 and microP2 cards offer a RAID-type error-correction system similar to that of many external computer drives. Most consumer-grade cameras and camcorders are compatible with CompactFlash (CF), Secure Digital (SD), or Memory Stick type cards, and several cameras now feature dual memory slots, allowing you to use up to two cards at a time. Common combinations include two SD slots or one CF and one SD slot, along with a handful of different combinations.